There are times in anyone’s life that they’d like to cover up whatever their hair is doing and pregnancy and postpartum seem to have a high concentration of those times! 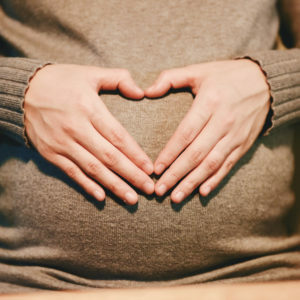 Whether it’s because the hormones are making your hair do crazy things or because you’re too busy (or sleep deprived) to take a shower, much less make it into the salon for a root touch-up, we’ve been there. 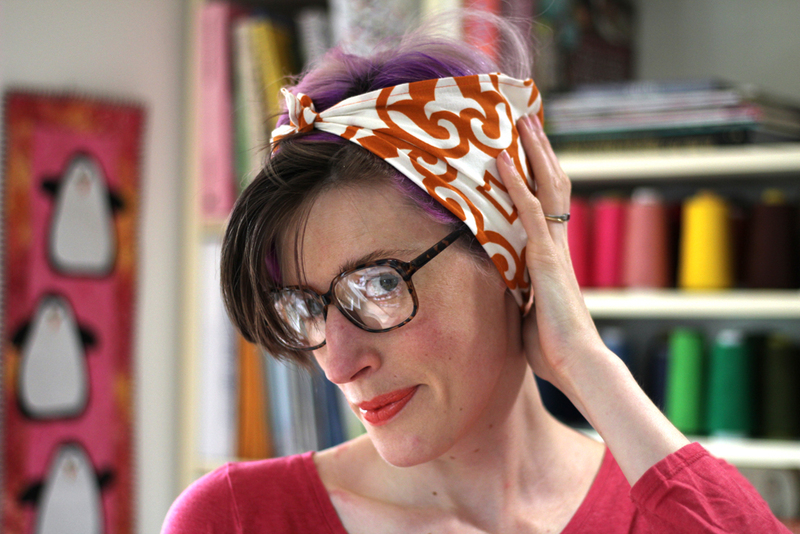 My favorite thing to do when I want to look cute and hide my hair at the same time is put a kerchief in my hair. 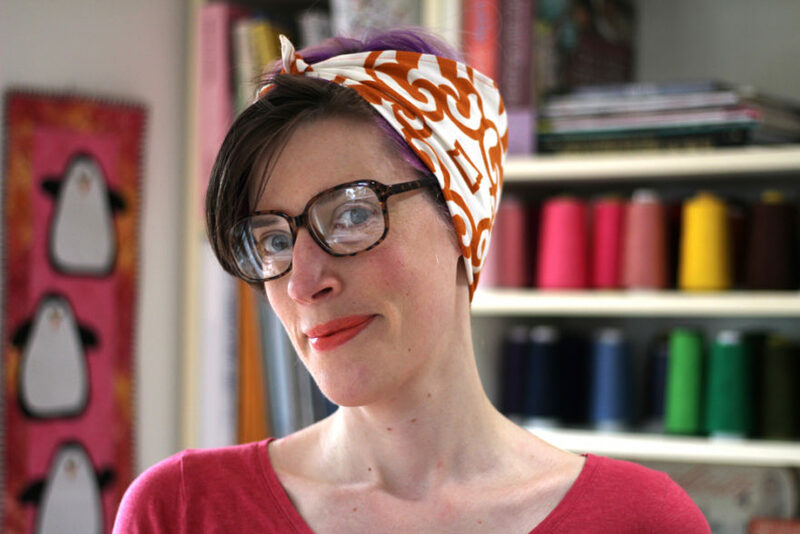 Sewing a hair kerchief is a quick and easy project and makes it so you can coordinate with any outfit at a moments notice. 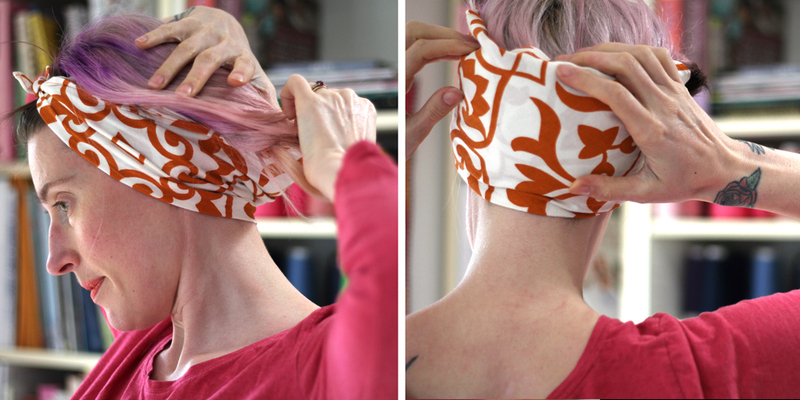 How to Sew a Hair Kerchief: Start by cutting a square of fabric that is 18″(46 cm) – 25″ (64 cm). 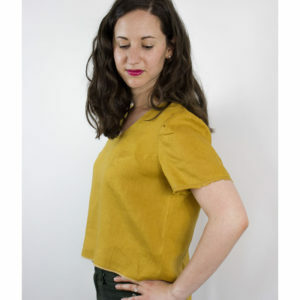 100% cotton is the easiest to sew because it takes a press so well, but a drapier fabric (like the rayon crepe pictured below in yellow) can look beautiful too. 18″ (pictured in the print above) is the smallest you’ll want to cut because any smaller and you won’t be able to knot it around your head. 25″ (pictured in the yellow example) is the largest you’ll want to cut because any larger and there’s just too much fabric to style it. 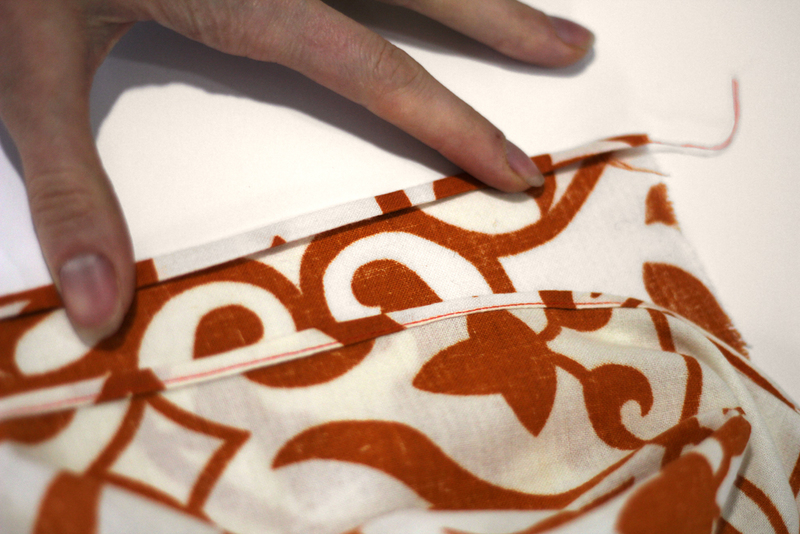 To finish the edges, we’ll sew a narrow hem. Starting on opposing sides (either top and bottom or side and side), sew a seam that is 1/4″ away from the edge of your fabric. 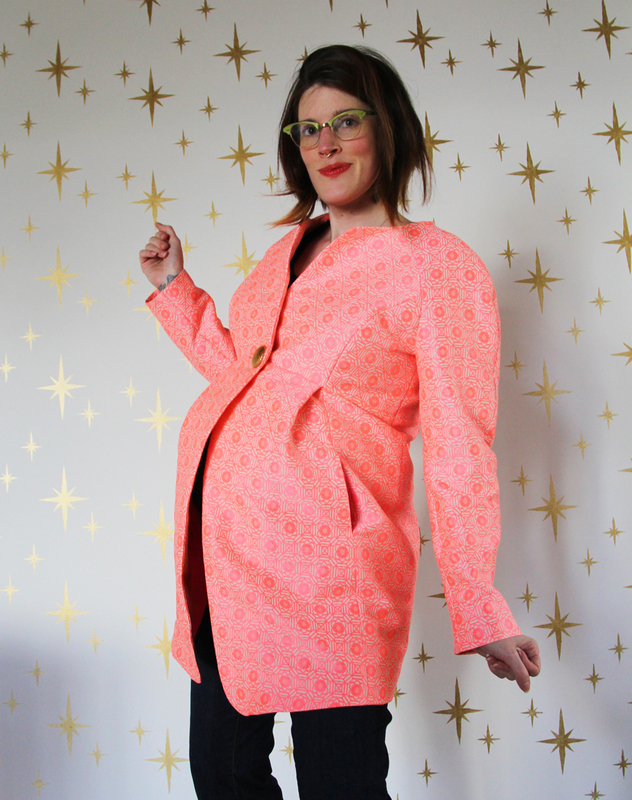 (You can actually pick an size seam allowance that is easy for you to sew since we’ll be trimming it down, but 1/4″ is a good starting point). This seam serves to give us a line to follow when we press in the next step. 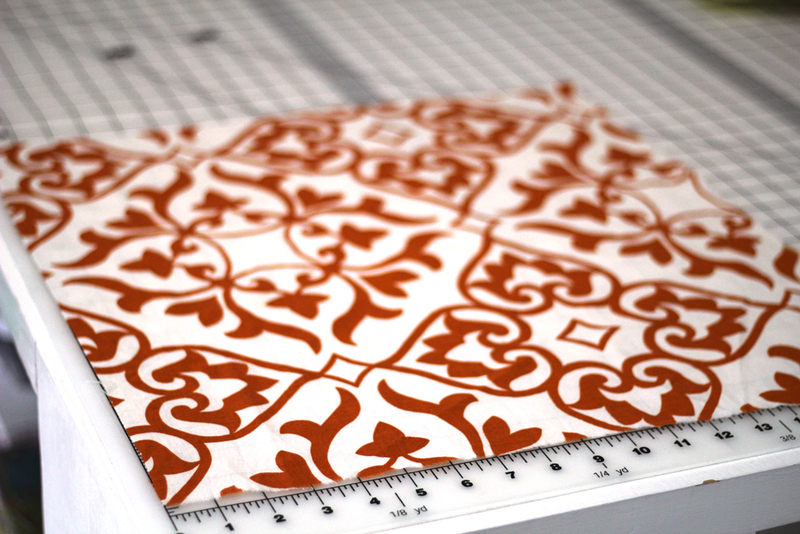 It’s especially important if you’re sewing on a wobbly fabric or on a curve. Press your fabric to the wrong side so that your stitch line is just inside the press line. 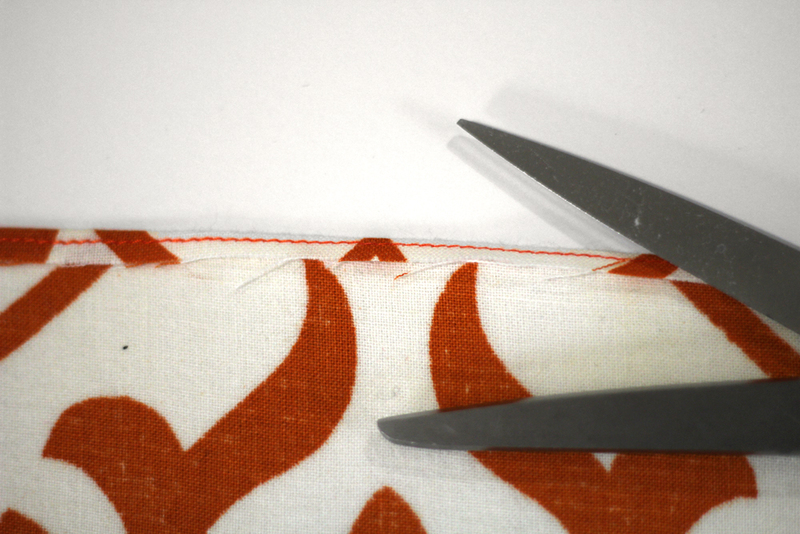 Trim your folded fabric down to 1/8″. 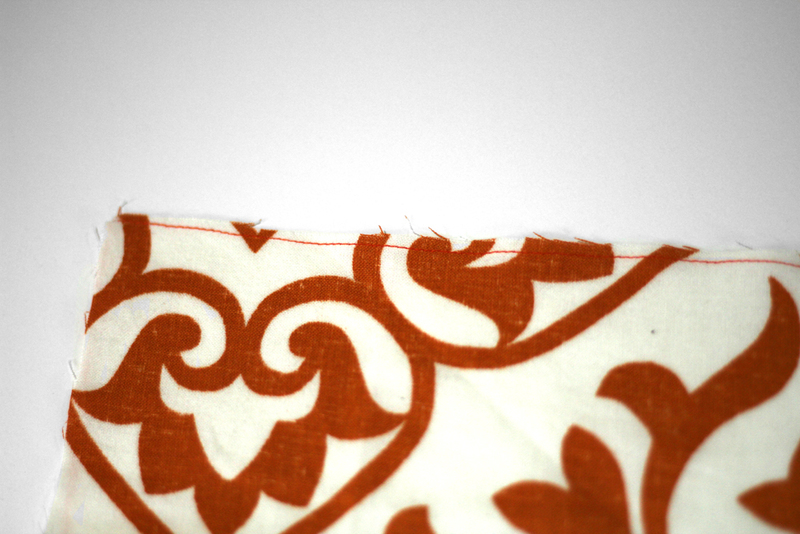 (This trimmed amount will be the finished width of your narrow hem). Press the fabric to the wrong side again and then stitch it down. Repeat the narrow hem steps on the two sides that are left, backtacking your stitches at either end of the last seam so they don’t unravel. 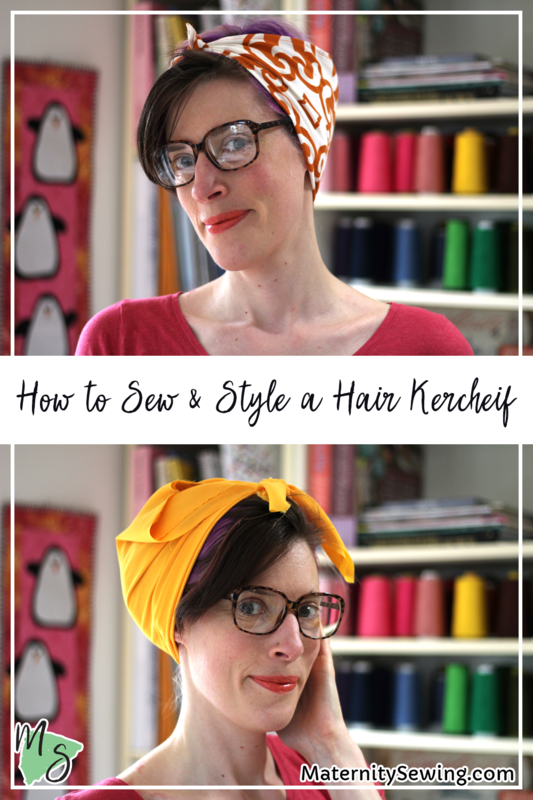 Styling a hair kerchief: Though there are many ways to style a kerchief, this is my favorite because it’s femme and timeless while still offering lots of hair coverage. 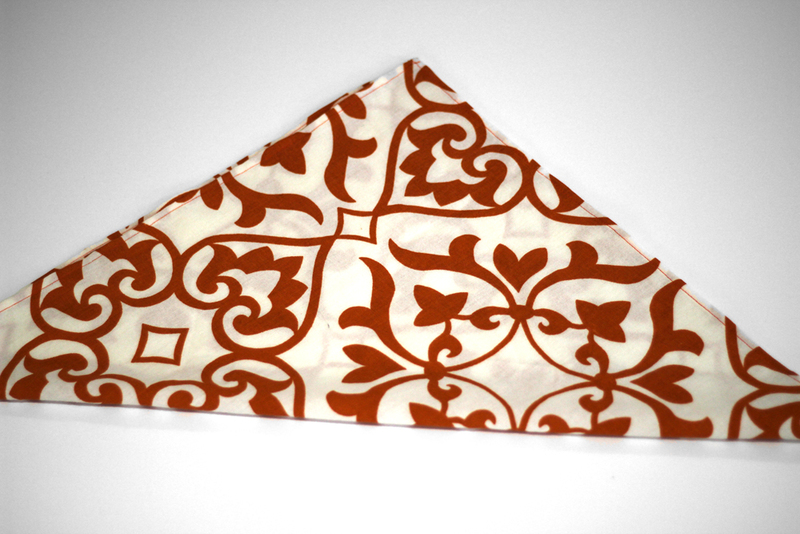 Start by folding the kerchief on the diagonal to make a triangle. 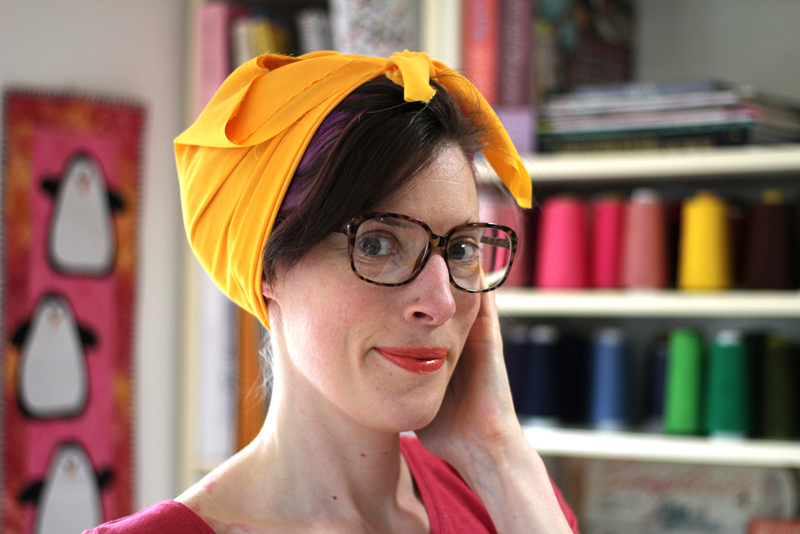 Wrap the kerchief around your head and tie the ends together in a knot (you can see there’s very little knot with an 18″ square). Once you have your knot tied, put it over your head, pull the front up, and then tuck your hair into the back. 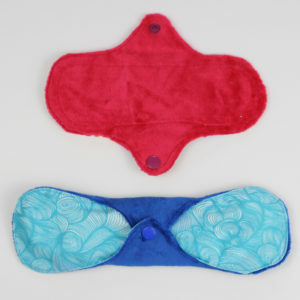 You can fold the pointed end of the triangle of fabric to the inside and tuck it down with your hair. Voila! You can play with little details to best suit your style – pull bangs back or leave them free, cover your ears or tuck the kerchief behind your ears. 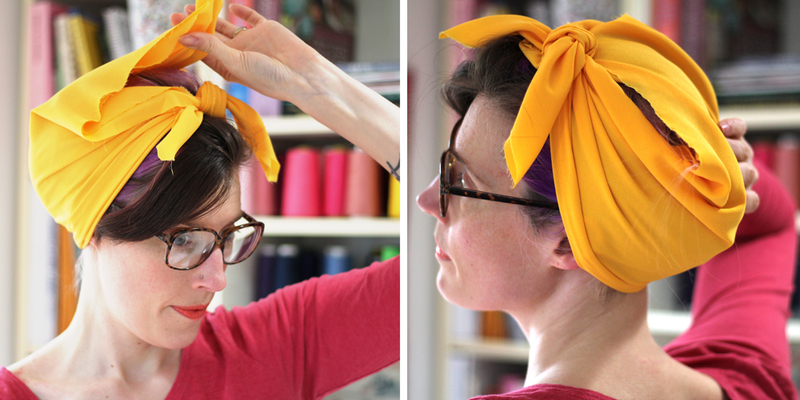 If you have a larger kerchief (like this 25″ example) you’ll have have a much bigger knot/bow. You can tuck the end of the triangle in with your hair as you do in a smaller triangle or you can pull it to the knot and tuck it up there for even more coverage of your hair. 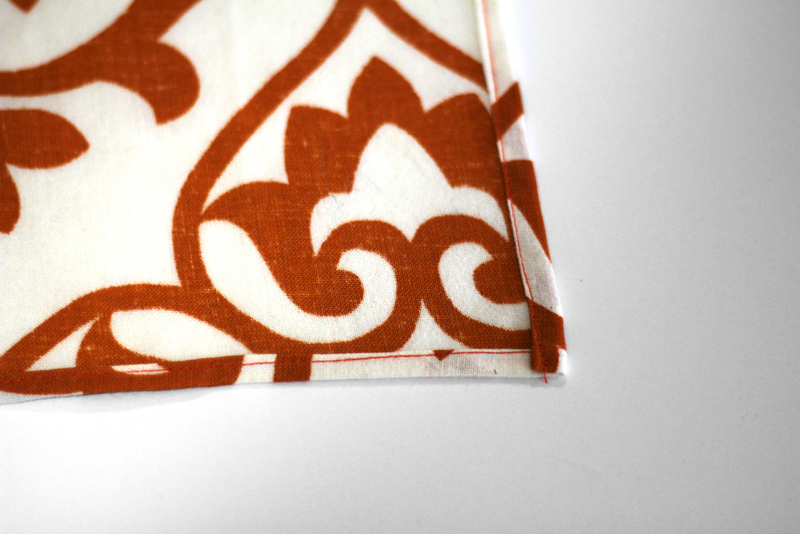 This leaves a lot of fabric showing in the back so it’s a great way to show a pretty fabric! 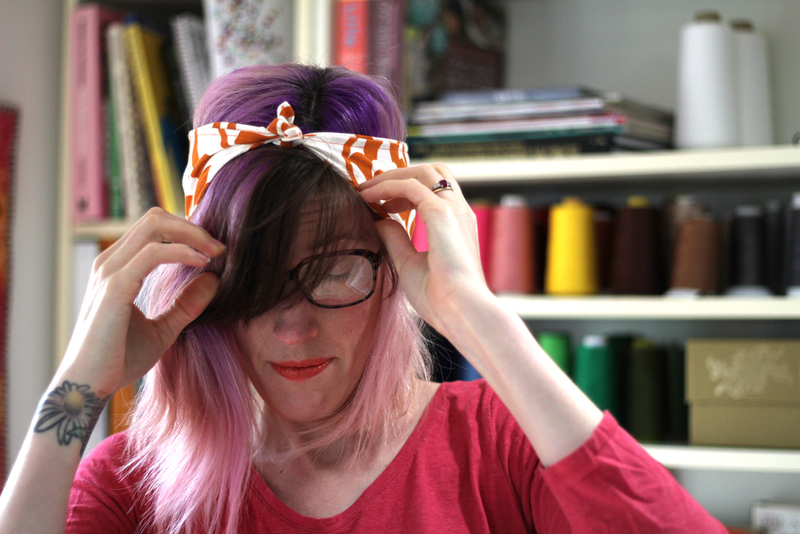 Desperate to get your hair covered and can’t even find the time to sew a narrow hem? You can see in this yellow example I didn’t even finish the edges and it still works!